Our Online Shop has been updated and it's now easier than ever to buy instructional Israeli dance DVDs and CDs. INSTRUCTION of the dance and VIEW of it being danced to the music. It also includes a CD with the music of each dance. We do sell CDs separately if required. We invite you to visit the NEW Perth Australia Hora Shalom website. See what classes they offer, what dances they've taught recently and be in touch with this lovely city. Update from Lorraine & Abe Basist from Melbourne Australia, on their first experience of the Karmiel Teachers Course in Israel. We 've started our Teachers course & it is full on. No time for anything but dancing ,eating & maybe 2 hours sleep. It is crazy!!! We went to a Harkada with Gadi Bitton where there were 1000 dancers [that is a small estimate probably more] It was amazing!!! Wonderful dancers & many choreographers I could not keep track of them all. It was such a buzz to dance in the middle with so many other dancers & choreographers. This was amazing from 8pm till 6am the next day. They dance like meshugeners & we were among them! We stayed till 2.30am & the bus took us from this venue on the long drive to Karmiel arriving at 5.30 am. We had a little sleep & then went to bed till we got up to have breakfast at midday. I still haven't recovered! We went to another Harkada at Haifa beach last night with Oren Ashkenazi. We have another session today with drumming & choreographers. I'm tired but it really is wonderful & we are enjoying it so much we cannot express. All of us Aussies are having a ball. We will be in a performance tomorrow that will be judged by choreographers[our own troup]. This is exciting to be part of!!! This is an ongoing fund to be used now and in the future to support participation in the Karmiel Festival. Please consider a gift in any amount to the Amutat Festival Karmiel Summer Course Fund. Tampa Orlando Pinellas Jewish Foundation, Inc. is a 501(c) 3 not-for-profit organization. Gifts made to Tampa Orlando Pinellas Jewish Foundation, Inc are tax deductible to the full extent of the law. Checks should be made payable to Tampa Orlando Pinellas Jewish Foundation, Inc. and mailed to: 13009 Community Campus Drive, Tampa, Florida 33625. Please add a note that you are contributing to the Karmiel fund. My name is Debbie Dorsky Meitin. I had the privilege of attending the Summer Course for Teachers and Dancers of the Karmiel Dance Festival last Summer (2008) and will be attending again next month (July 27-August 7, 2009). It was an incredible experience, being part of an international mix of people who love Israel and Israeli dance. It is a unique opportunity to learn from the choreographers and be part of the excitement of Israeli dance and culture while in Israel. In many communities throughout the world there are teachers and dancers who have not had the opportunity to be in Israel and learn from the sources. This course provides that opportunity. Unfortunately, between the general world financial crisis and specific local funding issues, many people do not have the funds to come to Israel to participate in the course. After my amazing experience last year, I decided to investigate the possibility of starting a scholarship fund to provide assistance for teachers and dancers throughout the world to come to the course. Through my local Jewish Federation Foundation, I have established the Amutat Festival Karmiel Summer Course Fund, which will provide partial scholarships for tuition for the Summer Course to worthy participants. I have contributed the funds needed to begin the fund and am asking for YOUR help by making a contribution as well. Through the diligence of Dany Benshalom, Director of the Course, several potential recipients have been identified for this year2009. Your contribution would enable more dancers to attend this year and into the future. All gifts will be greatly appreciated and acknowledged. As mentioned above, this will be an ongoing fund to be used now and in the future to support participation in the Festival. Please forward this message to any others you feel may be interested. Please contact me directly if you have any questions about this. All queries are treated in confidence. Thank you to all of our donors and our sponsor, the Israel Folkdance Festival of Boston, Inc., for making the Dancership a truly amazing reality. This year we will celebrate Purim by hailing the country of Israel as the melting pot of so many nationalities. The idea is to do an individual root search (use "Shorasim" for the warm up) and see who your ancestors are. To help you decide and to provide you with some inspiration, here's a famous clip of Arik Einstein and Uri Zohar (the latter in his atheist phase prior to becoming a rabbi). In case your Hebrew is not as strong as your dancing skills, don't worry about it, as the wording in the clip is mainly gibberish. Just watch the waves of immigrants coming to Israel from various countries to become one nation. The immigrants seem to be integrating extremely fast, as it takes about 10 seconds for the last wave coming from "Georgia" (the one in conflict with Russia, not ours, here) to become "true Israelis" and start preaching to others about their suffering and troubles encountered during the building of this great country. It will be a fun session. We will dance to songs affiliated with many countries to celebrate our diversity. Machol Hashalom, Tevorchi Artzi, Be'har Hagilbo'a, and Rak Beyachad Nenatze'ach. We followed the lyrics of Tevorchi Artzi and danced Rak Beyachad Nenatze'ach twice after we talked, as a group, about the meaning of the song. Thanks to www.hebrewsongs.com for providing us with the English translations. This dance session was a meaningful teaching opportunity for our younger dancers, in particular, to connect with and to support Israel duing this difficult period. We found this experience very moving and it brought us closer together as a community. We wanted to share this idea with all of you. We feel that this illustrates the power of Rikudei Am to unite us. A Hebrew U. Honorary Doctorate was awarded to Ohad Naharin, one of Israel's leading choreographers and dancers and a world leader in the field of modern dance. Naharin made his mark on the local and international cultural scene through his contemporary productions and unique body movement. Since 1990, he has been the artistic director of the Batsheva dance company for whom he has composed over twenty works. The French government crowned him the "Knight of the Order of the Arts", and he was twice awarded the renowned Bessie Award in New York for his outstanding achievements and innovations in dance. In 2005 he was awarded the Israel Prize. Article: A Guide for Workshop Leaders: How to teach Israeli dancing in a professional manner to non-Hebrew speaking audiences. Report from the United States about Chunky Move's performance of "I want to dance better at parties" in Massachussetts, USA in July 2007. "I bought 8 tickets for this performance back in March because it mentioned Israeli Folk Dancing. Chunky Move were going to be performing at Jacob’s Pillow in a resort area in Western Massachusetts called the Berkshires. When I looked a little further into the description of the performance I saw that it mentioned Jack Steel and “the database”. Then I googled Jack Steel and Chunky Move and discovered that they would be performing Debka Gid by Moshe Eskayo. Moshe had actually just re-taught Debka Gid at Sababa recently! The performance of "I want to dance better at parties" at Jacob's Pillow was simply fantastic. Creator Gideon Obarzanek is extremely creative and imaginative. We were so thrilled to see Al Salsalim and Debka Gid performed so nicely by professional dancers. We met with Gideon after the performance and spoke for a while. It was explained to Gideon that the dance was named after Moshe Eskayo's torn Achilles tendon (=Gid) that he got while choreographing the dance." Read about Ira Weisburd's 25-year quest for the original recording to his dance "Bo'i Malka"
Read a report from the 2006 Karmiel Festival, great details and info! Keep track of "Rikud Hashana"
The favourite dances are voted by a poll of the participants of the Rikud Israeli dance chat list. Rikud Hashana is compiled by Meliss Jakubovic Bachar of Atlanta, Georgia, USA. This is the hard-copy book version of the Israeli Dances.com Online Database. ****Please note that we sell the entire range of Israeli made DVDs and CDs, new and archival. Learn Circle and Partner dances from the source. We may not have every dance you require on our Shop site. Please ask for any dance and we will source the tape for you. Q "How do we know when the latest Israeli workshops are out? We like to see the latest dances"
Q "We need Israeli dance DVD's with instruction in English." A English is included only in Beginners Circle Basic 1. The only other DVD that is in English is number 67, but the dances are much more advanced. Q "We have no knowledge of Israeli dancing steps or dances. Where do we start?" Q We've done some very basic hebrew dance steps and want to learn some more difficult dances. What video would be a good start for us? A VIDEOS NUMBERS 8, 9 ,11, 12, 15, 16, 17, 18. The links below will take you to the DVD's but Pal and NTSC videos are also available. Q "We'd love to learn some line dances, more than the basic." Q "We'd love the get the feel and flavour of the Karmiel festival in Israel." Q "We'd like to teach dances to kids with a wide range of ages." Please ask for any dance and we will source the DVD & CD for you. See other Dance DVD for sale from worldwide sources. Thank you for your wonderful feedback from every corner of the world. We've reprinted some of your great comments below. All the quotes below were unsolicited email messages. "Thank you so much for providing such an important information and resource tool to all of us." "Thanks for all the great work you do to keep israeli dancing global and accessible to everyone everywhere!" "Thank you so much for your fantastic website." "I LOVE your site and appreciate all the work that you put into it. Kol hakavod!" "Thanks for all your work that enriches the Israeli dance community worldwide. Your website is a great resource for so many people. I really appreciate your time, your effort and your great results!" "Your web is a dignity to Israeli Dance & Songs. Kol Hakavod." with all sorts of data and facts. Keep up the good work." "I use your dance and song websites often to help me. So, thank you for making my life easier! All of you should feel great for the different publicly-accessible resources that you provide." "Ive been a religious user of your site for several years it seems. I love your site and use it often. and also Hebrew songs dot com for translation of Hebrew lyrics into English. "I live in Germany, and I have been dancing Israeli dances for 4 years. to find a new dance we are dancing." "I want to take this opportunity to tell you how much I enjoy your website. up popped israelidanceaustralia and the link to hebrewsongs. I have been telling all my fellow dancers about your site. I visit several times a week, there is so much to read." "Your comprehensive folk dance list is AWESOME!!! this fabulous list and your wonderful website! Thank you so much from all the folk dancers around the world. Again, many thanks for such a great resource for us!" "I really enjoyed looking through your site. It is a tremendous database and easy to navigate." "Your website is awesome!! Keep up the good work." (my favorite). .......You provide such a wonderful service. I'm so happy I found you." Find your favourite Israeli singers and download Karaoke backing tracks to their songs! Victor Majzner’s limited edition book "Painting the Torah" is an interpretation of the Torah from a purely Jewish perspective. 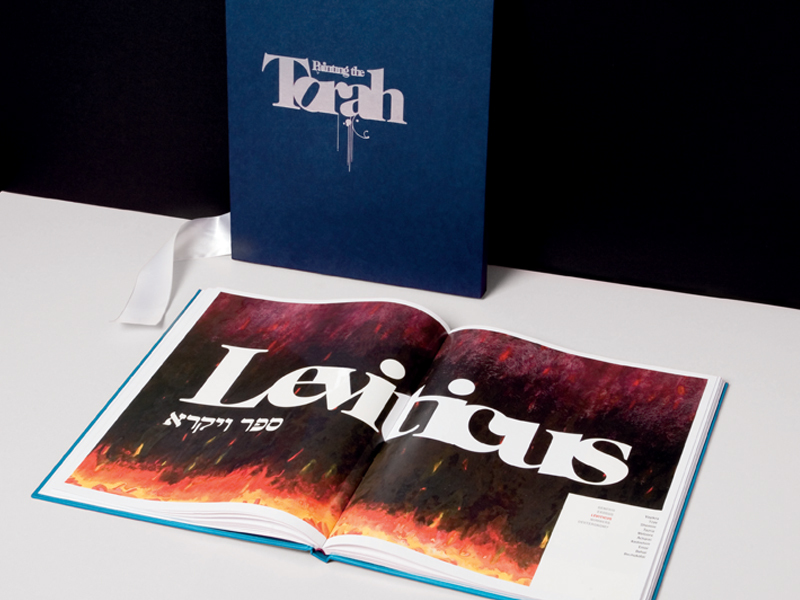 The paintings reproduced in this book reflect all of the 54 Parashot (weekly sections) of the Torah. A historic and artistic first. Small number of signed copies available.